Yesterday, a chorus of voices singing “The Eyes of Texas” and a shot from Smokey the Cannon kicked off the Dallas Chapter’s 25th-annual Get Teed Off at OU Golf Classic, which marks the start of the Texas-OU Red River Rivalry weekend in Dallas. 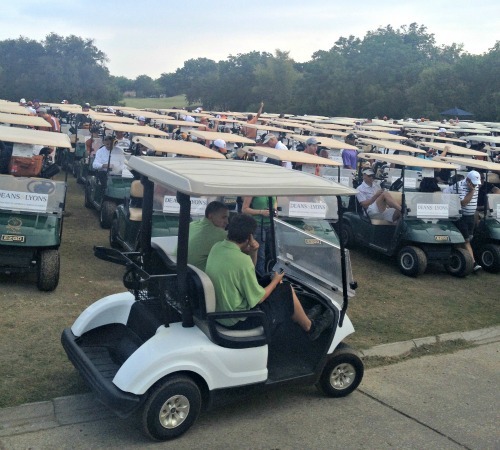 Before the Texas team hits the field Saturday, nearly 400 Longhorns hit the golf course each year to help raise money for Texas Exes scholarships. The event, said to be the Dallas Chapter’s biggest and best, didn’t disappoint. Here are five highlights of this year’s tournament. Nearly 400 golfers teed off at Firewheel Golf Park in Garland, Texas, on Friday. Thanks to this record-breaking attendance, the Dallas Chapter was able to raise even more scholarship funds for future Longhorns. 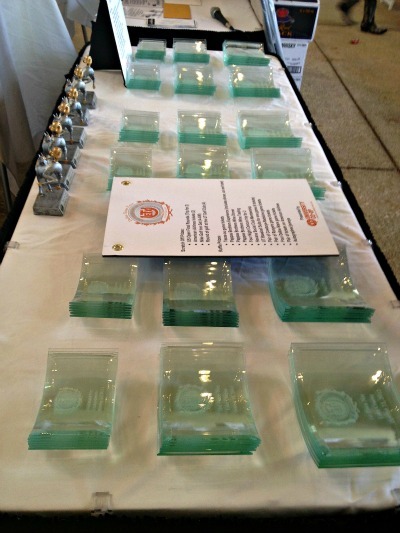 In its 25 years, Get Teed Off has raised more than $850,000 for Texas Exes scholarships, and 80 percent of those recipients are in the top 10 percent of their class—helping fulfill the Texas Exes’ mission to bring the nation’s best and brightest to the Forty Acres. 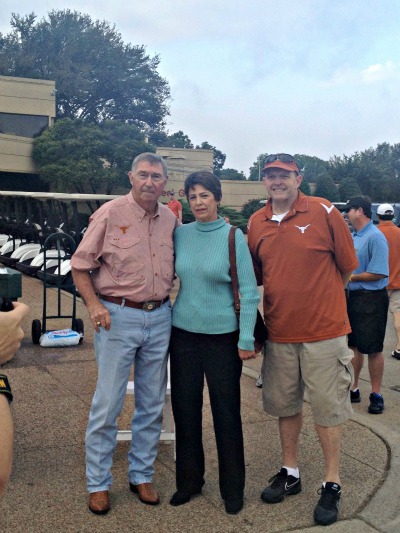 In past years, the Get Teed Off at OU Golf Classic has honored Longhorn greats such as Darrell K Royal and Tom Landry. This year, DeLoss Dodds was recognized for the many accomplishments in his 31-year tenure as UT’s men’s athletics director, which include 14 National Championships and 104 conference titles in nine different sports. Get Teed Off’s founder, Ken Capps, BJ ’82, Life Member, introduced Dodds by comparing him to Elvis, Madonna, and Oprah—all of whom can be recognized by simply one name. 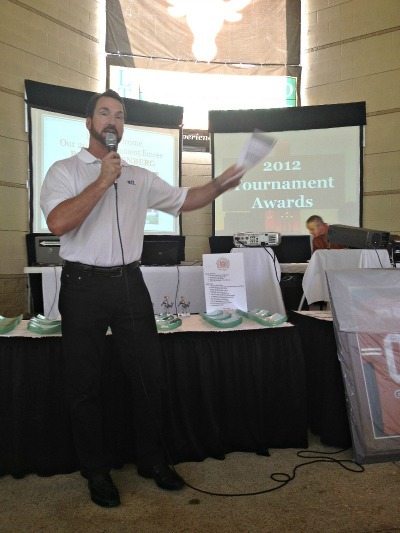 Former Dallas Cowboy and current CBS 11 sportscaster Babe Laufenberg lent his sparkling wit to the tournament’s awards ceremony this evening. “I love a drunk crowd,” he said after he was introduced. Though things didn’t all run smoothly—Laufenberg shattered a glass trophy after knocking it off a table—he had everyone chuckling. He was so well liked that one golfer even asked if Laufenberg was free for a round of golf on Sunday. From Dallas Cowboys tickets to bottles of Johnnie Walker Blue Label whiskey to American Airlines flights and Pappa Bros. wine tastings, the day’s winners were treated to a host of amazing items. Golfers were rewarded for longest drive, straightest drive, and closest to the pin, as well as team awards. Event attendees could also purchase raffle tickets or scratch-offs (just in case their play was less than stellar on the course). One lucky Longhorn fan even took home an autographed Vince Young jersey (pictured above). One unfortunate team of golfers took home the Razzie award of the tournament: the “Dead @#! *% Last” award. Six Longhorns earned a bobble-head-like horse trophy (we won’t tell you which part was doing the bobbling) for coming in dead last in the day’s competition. The group accepted the award in appropriate fashion: by posing with their backsides in the air for a photo op. 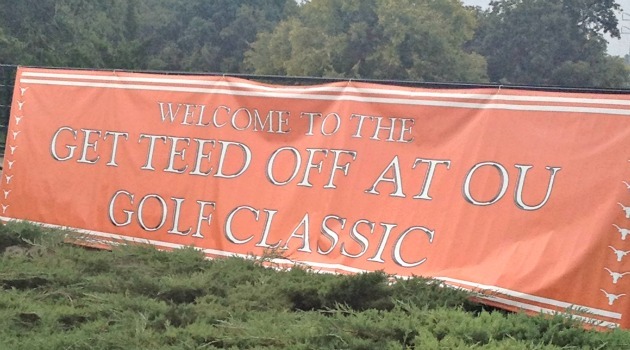 Learn more about the 25th anniversary of the Get Teed Off at OU Golf Classic here.